The lives of Jacob Heimer’s grandparents, even after they both died, served as a reminder that he could do anything, including pursue his Broadway dreams. His mother’s parents were survivors of the Holocaust. They met in Israel following World War II, then moved to the United States. His grandmother got her graduate degree in their new country and believed in Heimer, he said. He described them as rocks in his life. 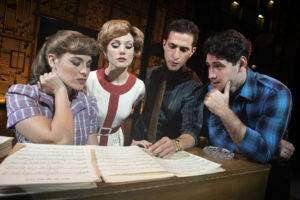 Their support helped take him to a leading role in the award-winning Beautiful: The Carole King Musical, which runs from Jan. 8 to 20 at the Academy of Music. 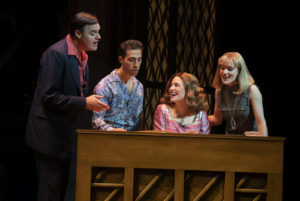 Beautiful tells the story of Carole King, one of the most successful female songwriters of the 20th century. It focuses on the years she spend building her career in the 1960s in Manhattan, as well as her romantic and professional relationship with her now-ex-husband, Gerry Goffin. The show includes many of her musical hits. Heimer portrays Barry Mann, a friend and competitor of King’s and another prolific songwriter of the era. Heimer grew up in Connecticut, where his family belonged to Temple Israel in Westport. He lived within driving distance of his grandparents, so he was able to see them weekly. When he was 13, he took a trip with them to Austria and Hungary and saw the places they lived and hid during the Holocaust. Heimer was a “rambunctious child” and a poor student, he said. Getting involved in theater helped him turn his grades around. He performed in school productions as well as a few professional shows. Heimer’s passion for theater eventually took him to study acting at Syracuse University. He has performed in productions of Soul Doctor, Milk and Honey and Twelfth Night. He has also done TV and film work in Difficult People, Chuck and Gold Star. He started on Beautiful as an understudy for the Mann role, which led him to landing the part. The musical presents Mann as neurotic and the comic relief, Heimer said, but to him, the heart of the role is his love for his wife, Weil, portrayed by Alison Whitehurst. Weil is another prolific 20th century songwriter. In addition to being a couple, the two collaborated on many of their biggest hits, including “Bless You,” “You’ve Lost that Lovin’ Feelin” and many more. He wrote the melodies, while she wrote the lyrics. The musical chronicles their meeting at the Aldon Music building and their professional and romantic relationship. This is not the first time Heimer has played a real person, and he said the experience presents some additional pressure. Most recently, he portrayed Jewish religious songwriter Rabbi Shlomo Carlebach in Soul Doctor. He has met the real-life Mann, who has come with Weil to see the show several times. Part of Heimer wanted to geek out over the songwriting legend, but he said he held back, and the two had a short, casual conversation. Heimer jokingly told Mann that he hopes he doesn’t screw up his life. Mann’s retort was funny, Heimer said, but one he won’t repeat.